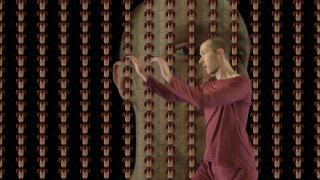 Mimi Garrard's evening of live dance and video was a collaboration with dancer Austin Selden. With unusual movement and background projections that are often multiple repetitions of Selden, fractal style, we are catapulted into beholding states of consciousness that are unfamiliar, even foreign. Austin Selden. Photo courtesy Mimi Garrard Dance Company. In geometry, were you exposed to the fourth dimension? Just as a Tesseract is foreign to a cube, the whole non-Euclidean world is foreign to us. That feeling of foreign-ness was my takeaway from the evening as a whole. Selden's image is projected into fours, dozens, hundreds of identical images that swirl behind and above the stage. His movements, especially in the first piece--the premiere, "Tell Me, O Muse, of the Woman"-- are a puzzle in themselves: sometimes Butoh-like, sometimes lyrical and wavy, sometimes tiptoeing across the stage. Selden holds himself with a crooked back. That movement style, I say to myself, resembles that of someone with abnormal muscle tone. Sometimes Selden is fluid, sometimes he's like a wounded animal. There is no literal meaning you can derive from his body language. I saw it as his reaction to peeking into a different states of consciousness. From the program, we learn that the movement is improvisation. I'd call it pretty classy improvisation. There is a spectrum of consciousness. Our pre-modern cultures believed in the existence of superior states of consciousness. "So why can't our digitalized culture do so also," ask Ms. Garrard and Mr. Selden. States of supreme calm, intense sharpness and incomparable sensitivity ought to be available to us, even in the digital age. The mind, we say, could expand to infinity--or dissolve into emptiness. Why else is Selden being surrounded by hundreds of clones of his image? In "A Single Hound" Selden wears a loose-fitting, comfortable costume that moves well with him. At points throughout the dance, he recites poetry by Emily Dickinson. 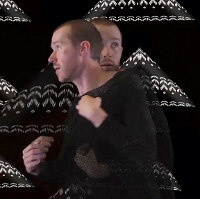 He snorts like a horse and dances duets with himself. Is he a homo sapiens or some kind of quadruped? Y'know, other animals have experiences that we, although we're pretty resourceful apes, can barely imagine. Think bats and whales. The mind of our human species cannot appreciate the world of a bat, which flies by echolocation. Trying to explain to a human how it feels to echolocate a flying insect is useless--we have no reference points to that experience. In the future, electronic helmets and brain-computer interfaces may open channels to these states. Until then, we have Ms. Garrard and Mr. Selden.